Spiritual emotion (bhāv) is the intense awareness that God exists. 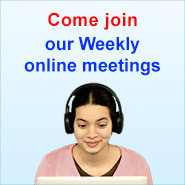 Increasing our spiritual emotion for God is an important endeavour in our spiritual journey. This is because when we have an intense awareness of God it leads to having intense devotion to God. When we have intense devotion to God, we lose awareness of ourselves and only remember God. When we reach this state, God bestows His grace upon us and we experience more and more Bliss (Ānand). Many seekers feel that just by doing spiritual practice our spiritual emotion is awakened. While this is theoretically correct, it is not guaranteed that this process will occur easily in everyone who undertakes spiritual practice. 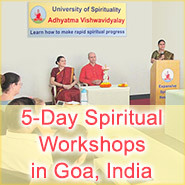 This is because whether we experience spiritual emotion through spiritual practice alone depends on many factors, including our objective in undertaking spiritual practice, intense yearning for God-realisation, the centre generated in our sub-conscious mind about God, the actual spiritual practice which is undertaken, and the spiritual path one is following. To increase our spiritual emotion at a faster pace, we must first learn what will help us to experience more spiritual emotion and then, more importantly, we need to make efforts to put that guidance into practice. In this article, we outline some of the efforts we can make to increase our spiritual emotion towards God and, as a result, hasten our spiritual growth. Ignorance: This means spiritual ignorance related to the form and qualities of God and His mode of functioning. One’s spiritual understanding can be increased by studying spiritual Holy texts written by Saints or websites such as ssrf.org. Doership: Doership pertains to the feeling that different incidents in life occur due to someone else or oneself, and not due to God. Ego: Ego is the feeling that ‘I am distinct from God’. This is the greatest obstacle to awakening spiritual emotion. The greater the ego, the less are the chances of developing spiritual emotion. More information on how to reduce ego can be obtained from our section on reducing ego or reading the SSRF book on how to reduce ego that has been compiled by His Holiness Dr. Athavale. Personality defects: When there is an excess of personality defects, thoughts of spiritual emotion cannot be easily imbibed. Understanding what one’s personality defects are and then making efforts to overcome them is an important part of a seeker’s spiritual journey. We have explored each of these aspects in much more detail in other sections under spiritual practice. In the chart below, we have listed the various efforts that we can make that will help to increase spiritual emotion. The numbers in the bar graph show the relative importance of these efforts. We can observe from the chart that having the attitude that everything we do is service to God (Gurusēvā) will help us to increase our spiritual emotion the fastest. This will help us in focusing our actions in such a way that we receive the maximum benefits for our efforts. As you can see from the chart above, when we do all our activities (spiritual practice or worldly) as if we are serving the Guru, we receive the maximum benefit towards increasing our spiritual emotion. We have explained in another article, ‘Who is a Guru?’ the importance of a Guru in a seeker’s life. A Guru is the human form of the unmanifest (nirguṇ) guiding principle of God. It is because of God we have the gift of life. The Guru (or guiding principle of God) has been with us over many lifetimes guiding us patiently so that we are freed from the cycle of birth and death, realise God and become one with Him. When we are one with God, we experience serenity. When we understand the extent to which the Guru has been nurturing us and saving us over and over again, we are filled with a deep sense of gratitude. By serving a Guru, we serve God. Not all of us have the opportunity to serve God in a human form. However, we can do all our actions as if we are indeed serving His physical form. This can be done in our day-to-day lives and we have provided a few examples below. If we are washing clothes or cooking a meal, we can do it with the attitude that that we are cooking for God. Even when we serve the meal to others, we can think that we are serving God or Guru. Let us pause here for a moment. Imagine if God came to our home in a physical form and we were to serve God throughout the day, how would our actions and attitude be? Keeping this vision in mind, we can generate the same spiritual emotion when we serve our family members and the people we come in contact with. If we practice this one aspect, we will automatically find a positive shift in the spiritual vibrations in our homes and our spiritual emotion will increase as well. Following from the previous point, we can make efforts to make our home like a hermitage (ashram) and maintain it in a sāttvik manner. We can mentally offer our home to God or Guru and then look after it with the spiritual emotion that we are just trustees of the hermitage. This will also help us overcome the ego that “I am the owner of the house”. If we use every item in our house as if it belongs to God or Guru, then we will also handle the items with the appropriate care. Accordingly, the presence of God or Guru is felt at home. Once a seeker learns to see the God Principle in different instruments utilised in spiritual practice, gradually he or she is able to view God in everything. This assists him or her in realising the God Principle in both the living and non-living creation. One seeker would keep thinking that Guru was by his side in all situations and this helped him to eliminate the defect of fear in his nature. When we do any service unto the Absolute Truth (satsēvā), in the beginning we feel that we have done the satseva and with it some amount of subtle-pride is generated. However this is not considered as satseva in the true sense of the word. When one is carrying out satseva, one should do it with an attitude that God Himself is getting this satseva done though us and we should not have any doership. On completion we should pay gratitude to God for being given the opportunity to serve Him. A barometer for understanding if our actions have happened as service unto the Absolute Truth is the amount of Bliss we feel when putting in the effort. When we constantly introspect whether our activity is being done in a way that God expects of us as seekers, we develop spiritual emotion within ourselves at a faster pace. Chanting: Only if chanting is done with spiritual emotion does it reach God. Just as we effortlessly think repeatedly of someone we love or something we like (for example, a lover thinks of his beloved or a mother of her child), so also the mind should be conditioned to love God. When one begins to like or love God, one remembers God’s Name easily and experiences Bliss in repeating (chanting) it. Later, chanting becomes a way of life. Every half an hour one can pray unto God asking Him to deepen one’s chanting and enable one to chant with sincerity. Prayer and gratitude: We can constantly pray to God to help us in our spiritual practice and also to help us so that each of our actions happen as spiritual practice. Each time we pray, we acknowledge the fact that we need help and this instills a feeling of surrender which in turn lowers our ego. Prayer is actually a synonym for surrender. This act of surrender is complete only after we express gratitude. Gratitude is an instrument for offering the doership of an act to God or the Guru; hence it helps in reducing our ego. Often seekers forget to thank God for anything occurring as per their prayer. After invoking God’s help in doing some service unto the Absolute Truth, then when this service occurs smoothly and after deriving Bliss from rendering this service one becomes content and forgets to pay gratitude. A seeker can also develop subtle-ego about having spiritual experiences or experiencing Bliss. It is, therefore, important to offer the credit by paying gratitude for a spiritual experience or the experience of Bliss to God. Study and satsang: An easy way to increase spiritual emotion is by studying the efforts of seekers who already have spiritual emotion. For this it is important to be present in the company of the Absolute Truth (satsang) and observe those seekers who have spiritual emotion towards God so that we can learn from them. We suggest that you read the SSRF book on how to awaken spiritual emotion daily and put something new from it into practice on a regular basis. Learning attitude: Try to see God’s hand in everything and view everything as a tool for learning. This includes every situation whether it is good or bad. When we are in learning mode we are always Blissful because we have the attitude that God is with us and teaching us how to be better seekers through everything that we encounter and experience. Reducing ego: If we contemplate on the Guru’s mission continuously, then our actions occur in accordance with God’s wishes. When rendering service unto the Absolute Truth, we should not allow wrong reactions or doubts about others to enter our mind, because if our reactions hurt other seekers, then the grace of the Guru will not be bestowed. That is why it is always advisable to practise ‘devotion unto God as a servitor’. In this form of devotion, the devotee considers God to be his father, mother, everything and himself to be God’s son or servitor. When we are humble, we make efforts to reduce our ego and are hence able to make more efforts to increase our spiritual emotion.